Buying your hardware and software from the same manufacturer is usually a good bet for hassle-free recording. Steinberg's latest package bundles their Cubase SL2 sequencer with a four-in, four-out USB interface. What's the attraction of buying a single 'system' to meet your computer recording needs? For one thing, it gives the combination of software and hardware an unmatched stamp of approval in terms of interoperability, which is always good for peace of mind. Another factor is the price: you might expect to get a bit more for your money with a bundle compared to equivalent products bought separately from different manufacturers. Steinberg are no strangers to this idea. They've previously aimed at the cheap end of the market with their Cubasis VST Project Pack, and have worked hard at the not-so-cheap end to conjure up the aura of the 'system' by re-branding RME hardware for the Nuendo line. Now they're looking more to the middle ground, with a package that compares readily with Digidesign's M Box/Pro Tools LE bundle. This is the System 4, which comprises a pairing of the mid-range Cubase SL2 sequencing software and an all-new USB 1.1 audio interface called the MI4. Though early shipments were marked as Windows only, I'm informed that support for Mac OS X should be included in the same box by the time this review hits the shelves. All in all, the MI4 is — you guessed it — a four-in, four-out unit, with four analogue inputs, two analogue outputs, and co-axial S/PDIF and MIDI I/O. The first two analogue inputs are equipped with mic preamps, and round the back you'll find they boast connectivity in the form of separate XLR and balanced jack sockets (as opposed to the cooler-looking but less practical Neutrik combos). Next up are a pair of TRS insert points for inputs 1 and 2, followed by jacks for inputs 3 and 4 (unbalanced) and the main stereo output (balanced). A tour of the MI4's front panel reveals a single high-impedance instrument input, gain knobs for the preamps along with associated four-LED meters and phantom power indicator, peak and signal indicators for inputs 3 and 4, a direct signal monitor mix knob, a headphone output with its own dedicated volume control, and a master output level knob. There is also a bright blue power LED, which flashes if no valid clock source is received from the digital input, and MIDI activity indicators. It should be apparent by now that Steinberg have intended the MI4 to be a versatile solution for mobile and compact studios, catering for electric guitars, condenser mics and line-level studio gear at professional and consumer levels. It's also handy to be able to make use of any external processors you might have lying around, either as inserts, or as send effects via the S/PDIF I/O. The inclusion of MIDI I/O rounds out what I consider an extremely well-judged feature-set for the sometimes-mobile musician. Another point to note if portability is an important consideration is that the MI4 is powered entirely by its USB connection, and there's nowhere on the unit to plug in an external adaptor. The possible inconvenience here is that USB hubs or PCMCIA adaptors won't be able to supply enough juice to get the MI4 working without being powered themselves. On the subject of USB practicalities, those not overflowing with USB ports will be pleased to note that they won't have to allocate an extra one for the usual Cubase copy-protection dongle. With the System 4, the MI4 is the dongle — albeit a rather more useful one than we're accustomed to — and the bundled version of Cubase SL2 won't start without it plugged in. That's not to say it's the only interface you can use with the software (nor vice versa), and I had no problems switching between the MI4 and my normal Echo Layla 24. Cubase SL2 is, of course, the little brother of Cubase SX2, and unlike some of Steinberg's OEM 'lite' versions, uses the same code base as their flagship product. Since SX2 has received plentiful treatment in the pages of SOS, I won't expound too much about it here, but make sure you check out the review SOS November 2003. Many of the differences between the two products are likely to be fairly academic to most users, such as the reduction of the maximum track count from 256 to a mere 128, and the absence of a surround-sound audio path, which the MI4 wouldn't support anyway. The best way to make sure the System 4 caters to all your software needs is to download the PDF comparison chart from Steinberg's web site. 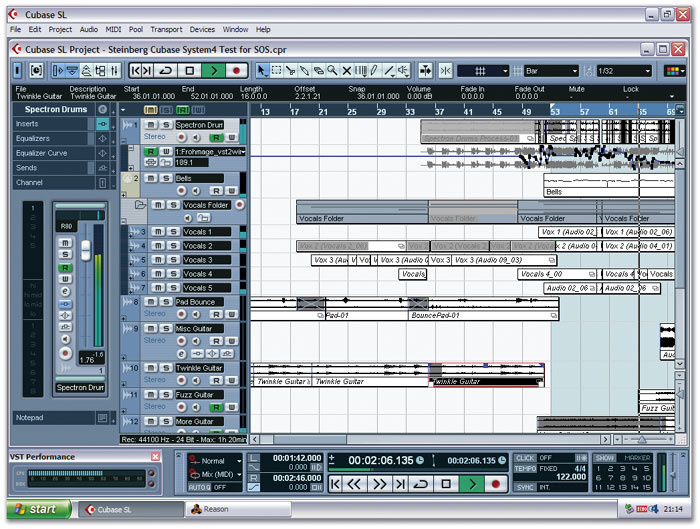 For my way of working I really didn't find much wanting in Cubase SL2 compared with SX2. Unless the score element is important to you, the biggies are likely to be the lack of off-line processing with VST and Direct X plug-ins, and the more limited configurability of the mixer. Otherwise, most of the best new features from the SX2 upgrade are present and correct, most notably the multiple-take track view function, which Mark Wherry rightly praised to the heavens in his original review. Installation under Windows XP is as easy as USB has always promised to be. All you have to do is run the device installer and follow the prompts as to when to plug, unplug and re-plug the device into your PC. You don't even have to reboot afterwards, and the unit appears clearly labelled in your Control Panel hardware applet as MI4 Audio and MI4 MIDI (as opposed to the irksomely anonymous 'USB Audio Device'), so full marks to Steinberg. The first thing you'll notice when all is done is the presence of a new '4' icon in your Windows System Tray. This opens the MI4 Panel, which illustrates the internal routing of the interface and allows more in-depth configuration of it than is possible with the hardware alone. The mic preamps can be set up by enabling 48V phantom power or a -20dB pad, and you can toggle between the XLR and the jack connectors. In a similar manner, the second input pair can be switched between S/PDIF and analogue circuits, and the gain on the latter adjusted in four discrete levels between -8 and +10 dBV. Finally, the MI4 Panel lets you switch the direct monitoring source between input 1 on its own (for the high-impedance instrument connection), and each of the two analogue pairs. This is a less effective solution than allowing the user free rein to set up a monitor mix of all four input signals, and it's annoying that there's no way of hearing inputs 2, 3 and 4 other than panned as part of a stereo pair. I was also disappointed to find it's not possible to directly monitor the digital input. The other software side of the MI4 is its ASIO driver control panel, a customised version of that sold by Propagamma and licensed for many different USB products from many different manufacturers. This driver offers a choice of six latency settings, ranging from a 'relaxed' 138 milliseconds down to a 'high speed' 7 milliseconds, measured on the input and output combined at 44.1kHz. The remaining controls concern the device's clock rate and bit depth. Whilst the MI4 is capable of 24-bit, 96kHz performance on both the inputs and outputs, the limited bandwidth of USB 1.1 means that certain compromises have to be made when using the high-quality modes. At 24-bit a total of six I/O streams can be enabled (four in, two out, or vice versa), whereas in full 24/96 mode this falls to just two, with a choice of stereo in, stereo out, or one mono channel each way. For a reason I can only imagine to be a bug, the mono 24/96 setting would only let me record via the XLR input on channel 2 — despite it being deactivated in the MI4 Panel! Though Steinberg obviously envisage the hardware being used in conjunction with their software, it's worth pointing out that the MI4's four-in, four-out capability is only available if you use the ASIO drivers — to Windows it appears as a standard stereo device. In this case, the digital output mirrors the main analogue stereo outputs, a feature that could come in handy if you want to record to a Minidisc or something. I had expected the MI4's low-latency performance to be broadly similar to that of the last product I tested that used the Propagamma ASIO driver (Audiotrak's Maya 44 USB), and in general terms, it was. On my 1.6GHz Pentium 4-M Thinkpad, the lowest 7 millisecond 'high speed' setting was usable only under very light load, and at a 'rapid' 13 milliseconds the device showed a processor use between 10 and 20 percent higher than the nearest equivalent latency on my Echo Layla 24. Nevertheless, I found that stability at low latencies was rather better than I'd anticipated, either due to differences in the hardware or improvements made to the driver since I last looked at it. Except on the 'high speed' setting, the dreaded clicks and pops were entirely absent, and although real overloads still tended to have a truly stultifying effect on Windows, the MI4 was well behaved. In terms of audio quality, my tests with Rightmark's Audio Analyser very much agreed with the results listed in the MI4's technical specifications. Loopback recording at 24-bit/44.1kHz returned a residual noise level of about 93.1dB(A), along with total harmonic distortion of around 0.007 percent on inputs 1 and 2. Recording the MI4's outputs into my Echo Layla 24 gave a respectable noise figure of -95.6dB(A), which again concurs with that quoted in the specs. Where day-to-day use is concerned, I could find little to complain about on the quality front. The instrument input is clean and provides plenty of gain, while the mic preamps appear perfectly neutral and quiet. The outputs also sounded good to these subjective ears, comparing well with the Layla 24, though the maximum output level was about 6dB lower than that (more expensive, mains-powered) device at its -10dBV setting. 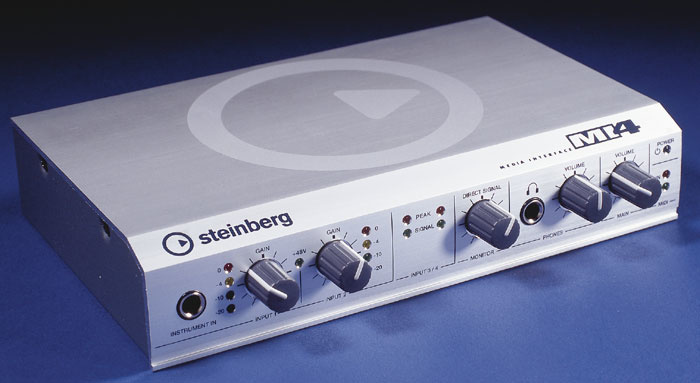 All round, Steinberg's System 4 comes across as a good way to leap nimbly into the world of computer recording, or replace an existing setup with a more compact and mobile one. The package is certainly very comprehensive, with a versatile hardware component and software that — albeit a 'mere' cut-down version of Cubase SX2 — is still massively powerful. 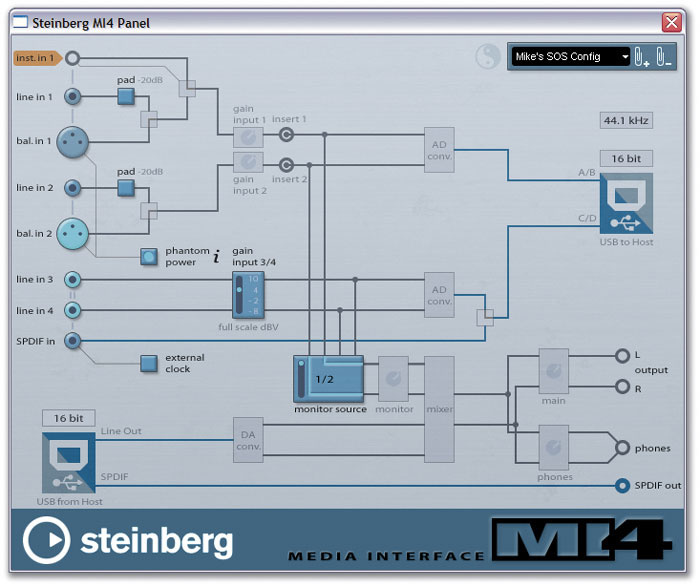 The decision to choose the System 4 over its most obvious competitor, Digidesign's M Box, will rest largely on whether the look of Pro Tools LE floats your boat more than that of Cubase, and I think it fair to say that Steinberg's is the more open and flexible bit of software. With twice the number of simultaneous I/O channels, plus the inclusion of MIDI, the MI4 also boasts a more generous paper specification, and whilst its retail price is a bit higher than the M Box currently sells for, things are already starting to even out on the high street. On a more general level, it's worth considering whether the MI4 — in common with other USB 1.1 interfaces — can meet your needs in terms of low-latency performance. For a lot of musicians this will be a non-issue, but soft-synth aficionados and those who require live-input monitoring should be mindful of the CPU penalty they're liable to pay when taking advantage of the speedier settings provided by the MI4's ASIO driver. The longstanding question mark over general USB compatibility is also a justified concern, though I experienced no such issues with the MI4 on my system. With these caveats in mind, it's easy to recommend the Cubase System 4 as a complete solution into which you can plug a mic, a synth or a guitar, and record using one of the best software packages around for a decent price. Processor: Pentium or Athlon 800MHz (1.4GHz or faster recommended). Operating system: Windows 2000, Windows XP Home or XP Professional. Processor: Power Mac G4 867MHz (Power Mac G4 dual 1.25GHz or faster recommended). Operating system: Mac OS 10.2.5 or higher. Versatile audio feature set with good 'plugability' for the compact studio. Cubase SL 2 software shares the stability and a good deal of the power of its big brother SX2. No additional copy-protection dongle required. Using the MI4 at low latencies can put a lot of strain on your PC. Usual USB bandwidth limitations to take into account where 24-bit/96kHz performance is concerned. Direct signal monitoring limited to two simultaneous inputs (panned in stereo), and excludes the S/PDIF input. Whilst those seeking the most efficient low-latency performance might want to look elsewhere, Steinberg's excellent Cubase SL 2 software combined with an attractive and versatile piece of USB hardware makes for a great package at a decent price.